Brandon Nelson, of Brandon Nelson Partners, sat down with Boundary Bay’s General Manager, Janet Lightner, for NW Way of Life News. Q: Janet, tell us about the launch of Boundary Bay Brewery. A: Ed dreamed up Boundary Bay all on his own. 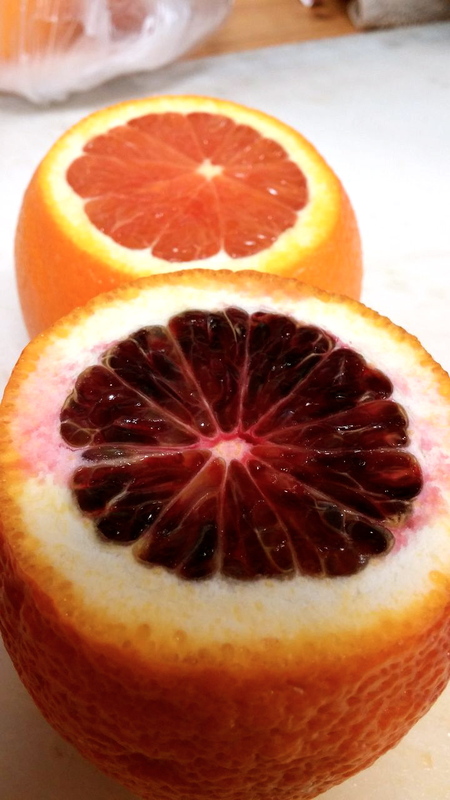 He had graduated wine-making school in Davis, CA, and had taken some malting and brewing classes down there as well. He already had a CPA from the UW and a good solid business sense. He felt strongly that a Brewery or Brewpub rather would be a more secure business model than a winery and chose that route. He loved the NW and wanted to get back so the search was on! He explored Whidbey Island pretty seriously, but was smitten with beautiful Bellingham and the College vibe. So Bam!! Here we are 20+ years after. I consulted with Ed prior to opening on the restaurant side of the business but did not join him for 18 months. Sustainable Connections, they wrote, “They think local first, take care of their employees and live the principled life.” Can you explain those key principles that guide your life? A: Think Local First is one of our Mantras. I choose to shop locally as I truly believe that is what gives us personality and longevity as a community. More money stays in Bellingham this way and you get to know your neighbors! Boundary Bay is more than a business to us. It has become a lifestyle and taking care of people is part of that lifestyle. We love and care about our employees and are their supporters on and off the job! Many have gone off to open their own businesses and that is such a proud moment! Both Mount Bakery and Wake-n-Bakery were opened by former Boundary Bay employees. Q: What has been the most challenging part of the growth and success of Boundary Bay? What are some unexpected lessons you’ve learned as the business has grown and flourished? A: The most challenging is that Boundary did not come with a book or a manual. Sometimes it feels like we are still writing it! When you love and care about your staff you take on more personal risk, at times I have felt like Mom to over 100 people (and as a Parent Brandon you know the intensity of those feelings)! When the staff thrives, you thrive too! When mistakes are made you feel the hurt as well. So yes, in a nutshell, the people have been the most challenging, but I would not do it any other way. Unexpected lessons!?? WOW!! The whole opportunity has given me so much! My instincts about the good inside all of us has been reinforced! I have dug deep in myself and found strength that I did not know I had. Working hard, dreaming big, caring lots. Q: Janet, tell us the story of the most meaningful experience you had during your trip to Nepal. A: Having lost my son Zack early in 2014 I was searching for a trip that would provide me with a physical challenge coupled with Spiritual relief. Trekking along the “Hemline of Heaven” provided both. The people sharing Namaste around each bend, the colorful prayer flags and the majesty of the Himalayas assuaged my heart and built back my stamina and zest for living. I am forever grateful. Q: Your Women’s Ski to Sea Team has an unmatched legacy of 16 straight victories! What’s it like to be the organizing force that brings these women together year after year? A: Yes! This will be year 17 for our Women’s Ski to Sea Team and we have won the competitive Women’s division 16 years in a row. The only Team I see beating that record or coming close to that is the Whatcom County Women’s Team. The organizing of the Team has become more event/reunion focused over the years as many athletes return year after year. There have been years of high stress trying to fill a spot on the roster. Injuries occurring days before the race have turned my world upside down. I’ve sat glued to the computer, or back in the day the telephone, waiting for a reply, clicking refresh, refresh, refresh! It has always worked out, but the anticipation can be brutal. It has been an honor to see our women go on to the Olympics and Worlds and becoming role models in their communities for women and girls to get outside and have fun! Going to Vancouver Olympics and watching Dasha Gaiazova race was an experience I will never forget. You can see her jersey hanging in the Tap Room at Boundary Bay right beside our Ski to Sea plaques! Our Team has blessed me with friendships to last a lifetime and a glimpse into the world of elite athletes that few may get to see. Q: Janet, when I think of you the one word that comes to mind is “Giving.” And we see your endeavors become just so, so successful. Could every business, and the communities they serve, benefit from this “Janet Lightner Approach”? Or am I missing a secret sauce that can’t be replicated? A: Giving~ It’s good for us to help others! Part of Boundary’s mission is to give back so I guess it is in my job description and I love it! Bellingham is a special place and I truly believe that the Non-Profits in our community help to weave heart into the place we call home. Helping them succeed in helping others or protecting our natural resources is an honor! I am surrounded by wonderful people who make Boundary successful every day. I used to joke it takes a lot of brains to run mine but it’s true. We have a high retention rate at Boundary with many of our Tribe staying for 10 years and more. I am lucky to have landed here and appreciate the contributions from everyone over the years! I believe in seeing the good in people and situations, resolving conflict for Peace. As for the secret sauce… well that is probably the Beer! Q: What’s on your bucket list?? A: Hmmmm. Today’s answer… visiting every one of our National Parks! Ah, Christmas Eve…a time of barely contained excitement and an inability to sleep. A time of last minute rushes to malls or grocery stores to grab those few things forgotten from the endless lists of the season. A time of final preparations for the following day and the festivities about to take place. Why not save yourself some stress this year? Buy Your Mom a Beer! It’s a common myth that beer is a boy’s world. But we know plenty of ladies who love their brews, too. Which is why we think you should bring your mom here for brunch in our Beer Garden on Mother’s Day! It’s been a tradition of ours for years and, trust us, the moms come out in full force…and not just because we offer each of them a free Mimosa. 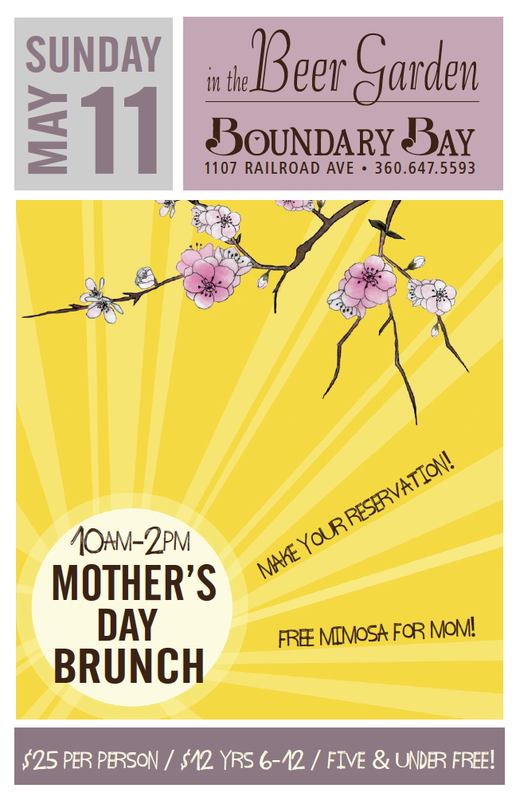 Bring the whole family down to enjoy brunch between 10am and 2pm on Mother’s Day – Sunday, May 11th. Give us a call to make a reservation at 360-647-5593 or tell your server when you’re here having a beer after work and they’ll get you on the list. Brunch is $25 per person, $17 for seniors, $12 for kids 6-12 years old and FREE for kids 5 years old and under. Ok, yes, maybe a brewery isn’t the first place that pops into your mind when you think about what to do for Easter Brunch. But we argue…why not give it a try? We’ve got all the fixings of a traditional brunch…and BEER! On Easter Sunday (4/20), we open up our brewery and beer garden extra early and invite the community to come celebrate with us. We serve up an all you can eat feast and even have an easter egg hunt (11:15am) in our beer garden for the wee ones. 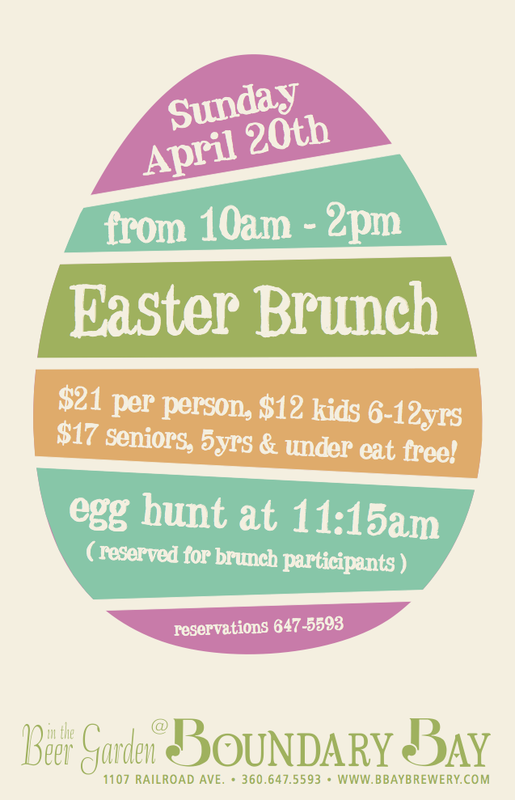 Those in the know, here in Bellingham, have made this a tradition, so be sure to make your reservations as space can fill up fast here on Easter morning! We’re accepting reservations for 10am, 11:3oam and 1pm — just call us at (360) 647-5593! $21 per person, $12 for kids 6 to 12 years, 5 years and under free. The craft beer scene has seen tremendous growth in the production and distribution of canned brews, so why the paradigm shift? There are a lot of practical reasons behind the craft canning movement; efficiency, recyclability, and consumability to name a few. At the core, it’s cheaper to produce and better for the environment. Cans are lightweight and easier to move around, in comparison to its heavier and more breakable, bottle counterpart. Distribution wise, a truck-load of aluminum cans proves to be a more portable process overall, as apposed to the glassware alternative. The same notion applies to the average outdoor adventure…canned packaging fits the occasion; light weight, unbreakable (unless you’re really trying) and satisfyingly crunchable once consumed. But besides practically reasons, “Beer cans also have a certain nostalgic appeal” states Charles Passy of Wall Street Journal, “that retro-chic factor, in other words”. “That sound of a beer can being opened”, ads Oskar Blues spokesman Chad Melis, “is one we associate with good times” Namely the 60’s, when cans were also at a pinnacle point in popularity! According to a study by the Beer Institute, in 2012 cans constituted 53.2% of the beer market, while bottles had a 36.5% share. If you look back to 2006, cans accounted for 48.3% of the market and bottles 41.9%. That’s a pretty significant gap, and it makes sense. Cans are more compact and less packaging means you can move the same amount of product in less trips, reducing your overall expense and carbon footprint simultaneously. So, there’s clearly reasons behind the…canned-ness…and we thought, what better event than the Bellingham St. Patrick’s Day Parade, a day centered around the showcasing of GREEN-inspired innovations, to announce the arrival of our newest 100% recyclable product! Pick up a 16 oz. 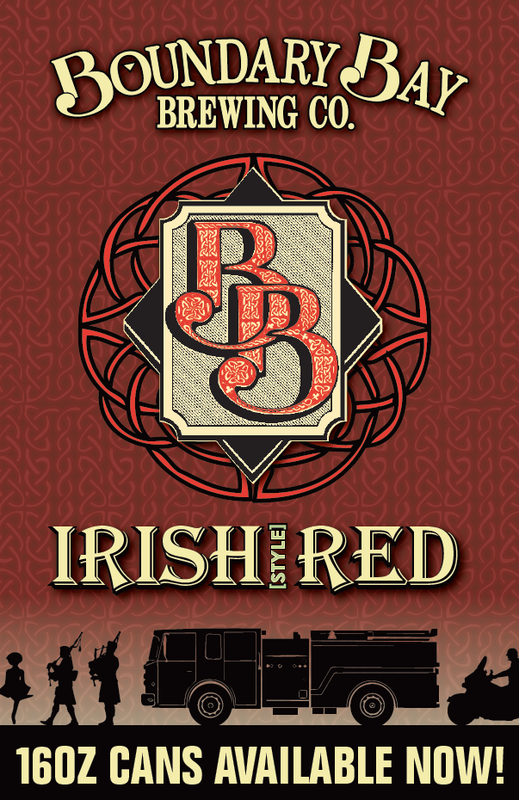 can of Boundary Bay Irish Style Red – just $2.25 at pint size! At 4% ABV, it’s the perfect session ale. Crack one and enjoy…wherever you might find yourself. Cheers! Join us in the Bistro for our first Beer Pairing Dinner of the year! By reservation only ($55 per person). Tickets are available for purchase at Boundary Bay. Once again, we’ve teamed up with Outdoor Odysseys to give you an experience you’ll never forget! 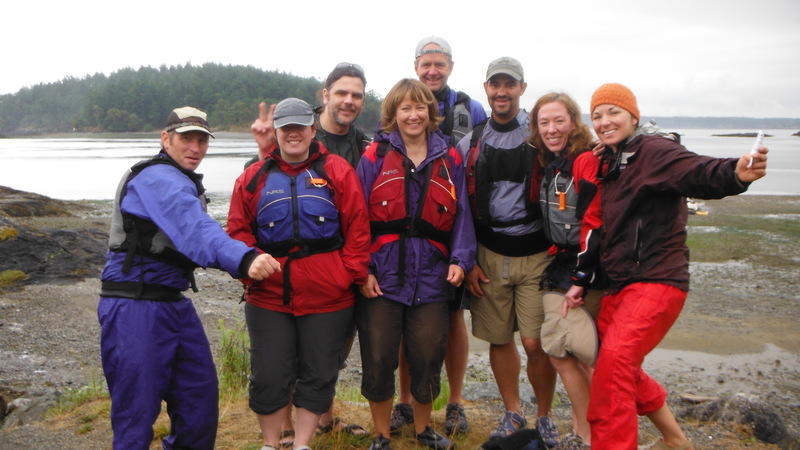 Join us August 23-25 for a three day Beer Tasting and Kayaking Excursion in the San Juan Islands. But get this, Boundary Patrons can now recieve 25% off the entire trip!!! 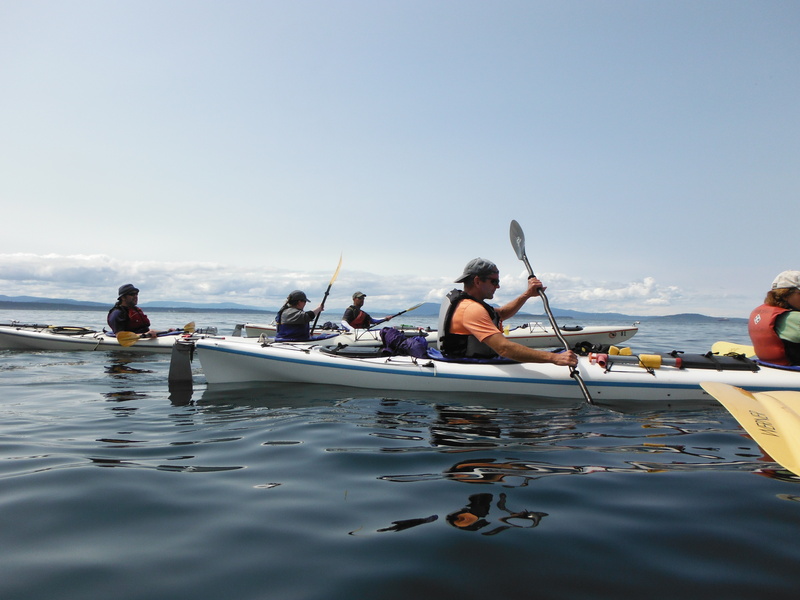 You’ll spend three days paddling around the beautiful San Juan Islands with an expert sea kayaking guide and two nights enjoying Boundary Bay beers paired with delicious camp cuisine cooked FOR you. You’ll camp overnight at Jones Island State Park, a boat-in campground known for it’s beautiful waterfront camp sites and scenic hiking trails. 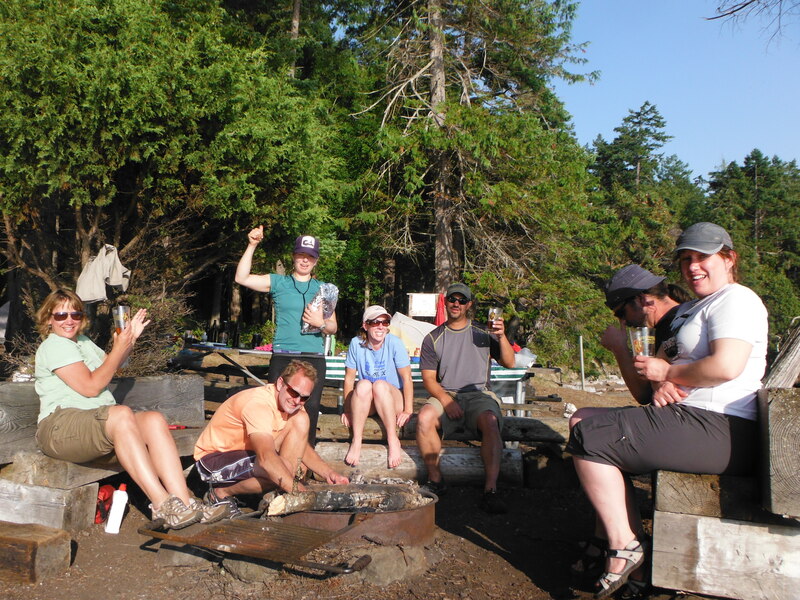 “Kayaks, Camping, Beer & Dinner or is it Kayaks, Beer, Dinner & Camping? Either way, all of them made my recent trip with Outdoor Odysseys epic. I don’t know how many people are as lucky as Mike & Kim Dave & Pat, Jon & Lakota and I to experience the San Juan Islands in such a memorable way. 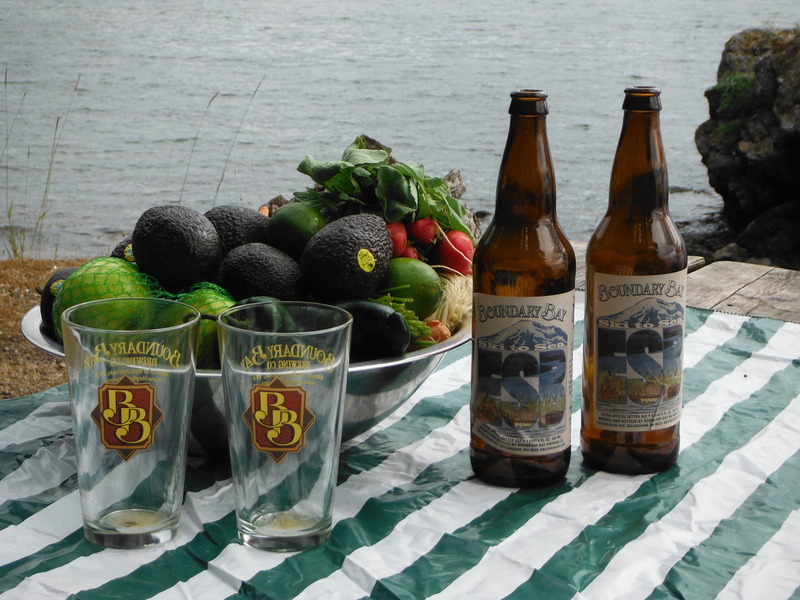 Kayaking from San Juan Island to Jones Island to camp and have fresh organic food paired with local Boundary Bay beer prepared for you isn’t exactly roughing it. It’s perfect. 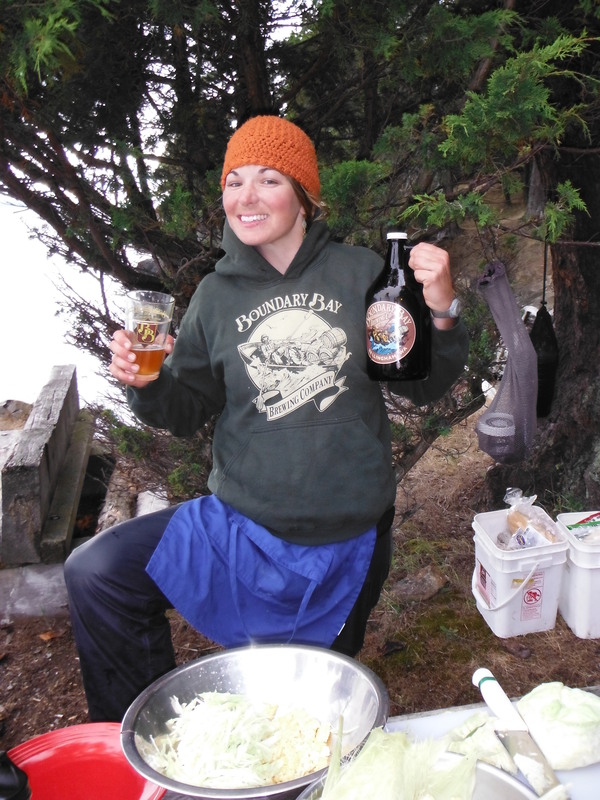 Chatting with Sarah, our kayak guide and chef, I had a good idea of what beers to pair with the food. Along the motto of “Be Prepared” there was enough beer and ten different styles for all to enjoy, Blonde Ale, Pilsner, IPA, Maibock, Oatmeal Stout to name a few. Seals and pups, bald eagles, fish, star fish, jellies, big horn sheep and deer were everywhere. The one elusive mammal and perpetual joke among the group, where are the whales? Well let’s not forget, whales live under water. That makes them hard to see, from a kayak. To receive 25% off your trip: If you’re booking over the phone, just mention you’re a Boundary Bay fan and heard about the offer. If booking online, enter BBAY25 in the “comments” section and the discount will be applied at the time of transaction. Boundary Bay and San Juan Cruises are excited to announce the return of our summer BREWS Cruises. Every Wednesday evening, we invite you to hop aboard the Victoria Star and tour the Bay as we serve a variety of our award-winning beers. Boundary will be joined by two additional Northwest breweries who will also be serving up their finest ales. These tasty brews will be paired with plenty of savory snacks. Spend a summer evening kicking back and enjoying the spectacular views Bellingham bay has to offer! Cruises are $35 per adult. Fee includes the tastings of three beers, per brewery. Cruises will sell out quickly so reserve your spot ONLINE or by calling 1-800-443-4552 or (360) 738-8099. (This summer, season passes are available!) 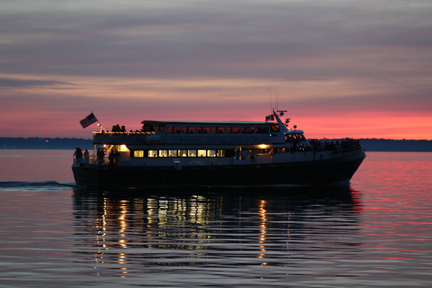 The boat departs from the Alaska Ferry Terminal in Fairhaven at 6:30pm. Check in 30 minutes prior to pick up your tickets and board the Victoria Star. Aug 28 – Boundary, Diamond Knot, Schooner EXACT Brewing Co.
Boundary Bay is delighted and honored to have loyal ‘Bounders’ like Liz and Chuck Mather supporting our Brewery and Bistro. These awesome folks decided to have a painting done of their “favorite place”– Boundary Bay. But what’s uniquely special about this piece, is the fact that Liz and Chuck are highlighted in portrait, sitting together in the tap-room with their Boundary Ales. This painting epitomizes the contagious Bellingham community spirit, that keeps local businesses like us thriving… and ALL of us at Boundary Bay are truly honored. Yes, it is true…the eight-year tradition of Reggae Night in our Boundary beer garden has come to a close. And while we’re all sad to see the DJ Yogoman Saga come to a close, we mustn’t lose Jordan Rain’s Wild Rumpus Spirit! So fear not, Loyal Bounders, we bring to you an epically fresh FREE Wednesday Night series we’re calling DUELING DJ’s featuring spin masters DJ KitchenSink and DJ IDLHNDS. So how is this going to work, you ask? Both DJ’s will be spinning “mini-sets” back and forth giving us as a feel for their individual sounds, while showcasing their ability to vibe off each other. 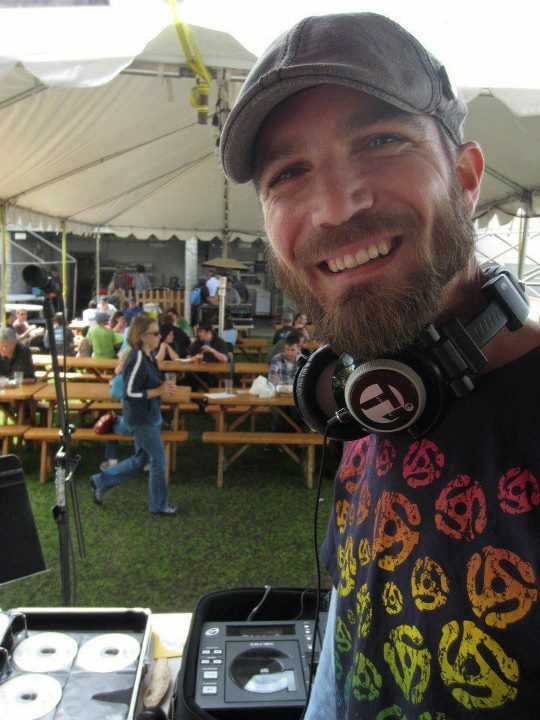 Gabe (DJ IDLHNDS) and Craig (DJ KitchenSink) have vastly different styles, and both have gained a substantial following of fans in our area. 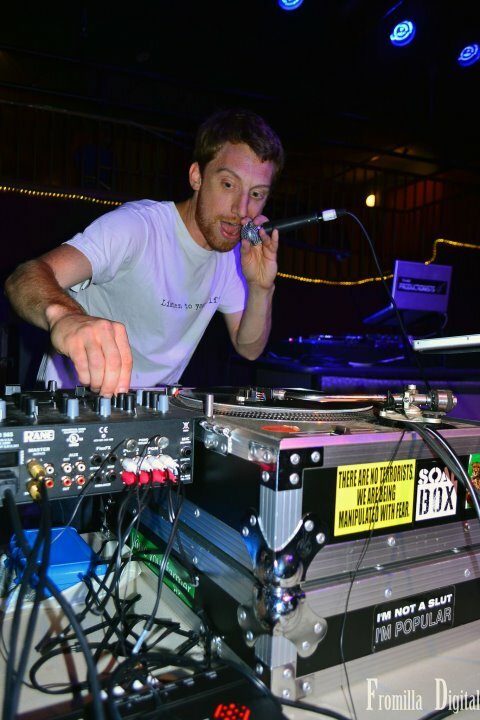 We can’t wait to hear the creative mish mash of music DJ IDLHANDS and DJ KitchenSink will produce as they take the stage in their first DUEL!